Each vege-capsule contains 7.5 billion colony-forming units (CFUs) of probiotic good bacteria, plus 250mg of prebiotic natural resistant plant fibres inulin and fructo-oligosaccharides (FOS). 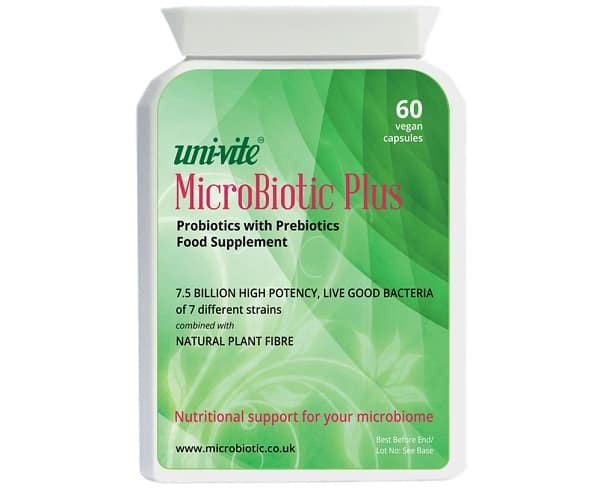 Take one MicroBiotic Plus capsule of 7.5 billion CFUs of good bacteria per day for 60 days. Follow this 2-month regime three times a year, because all colonisations weaken over time. To accompany a weight reducing diet, take one 7.5 billion capsule a day for at least 8 weeks. Take one capsule (7.5 billion CFUs) a day for a 30 – 60 day period.